McCauley Family and Cosmetic Dentistry (Bothell) - Book Appointment Online! 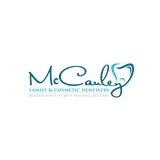 McCauley Family & Cosmetic Dentistry is a modern dental office in the heart of downtown Bothell. We use advanced training and modern technology to deliver comfortable, personalized dental care. Our friendly and professional staff led by Dr. McCauley provides teeth whitening, fillings, same day crowns, bridges, and other cosmetic dental services to our wonderful patients. We believe a trip to the dentist should feel like a day at the spa. We offer a complimentary paraffin wax hand treatment during or after procedures and hot lavender face towels for patients after procedures. If fear or discomfort has kept you from regular dental checkups, please let us show you a comfortable, caring patient experience. Everyone was incredibly nice and professional. The office was beautiful, clean and modern. Everyone was very concerned with patient comfort and overall the experience was excellent.